A couple of weeks ago I speculated in my early impressions that Tales of Vesperia - now available once again in English after nearly a decade mired in a past of Xbox 360 exclusivity and held by a publisher seemingly cold on the idea of bringing it back again - might be "the ideal Tales game". In retrospect, I didn't quite follow up on that claim at the time, partly owing to the piece still being based on my earliest hours with a game many fans regard as the greatest in the franchise's history. I still had to play more to know if Tales of Vesperia: Definitive Edition was worth the wait, or if it could be further elevated by the extra content brought over from the game's enhanced, never-before-localized PS3 port. Which leads to the inevitable question: How does it hold up after a decade, and is it really the "ideal" Tales game? Given that Tales games tend to be fairly similar to each other in an outsider's eyes, it's not always easy to see what sets Vesperia apart from such a large roster of releases, but even to a Tales dilettante like myself, the saga of Yuri Lowell and his buddies gets to the key business of what makes a Tales game a Tales game quickly and smoothly. The world of Terca Lumireis, ever beset by monsters, is only habitable thanks to the Blastia, ancient magical artifacts that protect from beasts and deliver conveniences. Local ne'er-do-well Yuri is on the trail of a thief, who has the temerity to steal a precious blastia from the people who can least afford to lose it. Yuri quickly gets caught up in events that scale all the way up to saving the world. Alongside him are a colorful crew of cast members, from his faithful canine buddy Repede to the almost painfully earnest Estelle. Also here are Karol, one of the least-annoying anime children ever created, the blunt and honest mage Rita, shady veteran Raven, and the elfin badass Judith. New to the playable cast are Yuri's old friend Flynn (previously cutscene-exclusive), and cheerful pirate Patty. 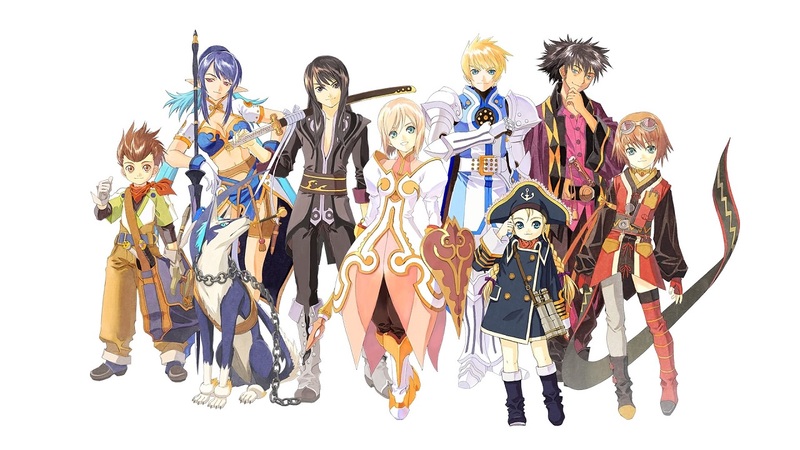 In a series where sea changes are rare and innovation tends to happen in the narrative and around the margins, Tales of Vesperia's greatest strength lies in its cast, and it's better than most at getting that cast far along the way towards embedding in players' hearts. Everyone is charming and just different enough from their selected anime archetype (make no mistake, they do adhere to a well-defined template most of the time) to stand out. This efficient-yet-endearing characterization is helped immensely by Tales' signature storytelling gimmick: The skit. Optional conversations that pop up throughout the game, skits fill in the airtime that players might spend grinding, or walking around the fields, delivering cleverly-written doses of story ranging from dry exposition about the world to hilarious little gags. Through presented minimally, every skit is expressive and, importantly, helps establish the characters and their relationships by letting players see them interact and bounce off each other. The urgency of the core story would never afford these kinds of moments without bogging down completely, so the skits are an ideal way to build the impression of strong chemistry between the cast. 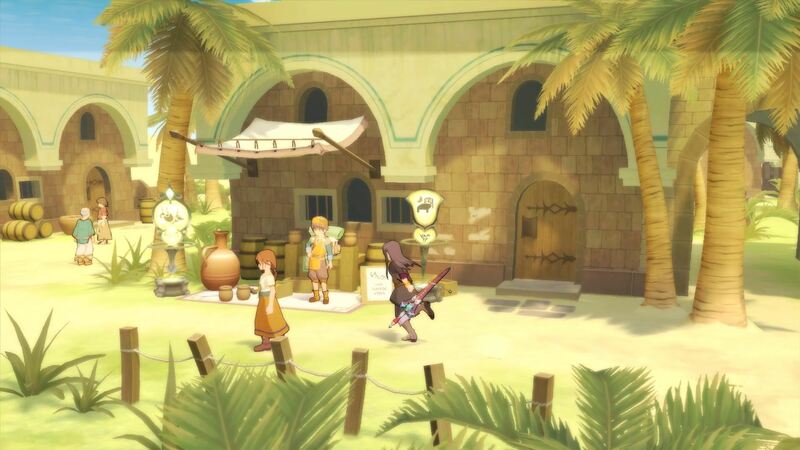 Every Tales game has its skits, but compared to the others I've played Vesperia is one of the best at establishing the feeling of a found family, that the bonds between these disparate characters are willingly formed and organically maintained. I wouldn't go so far to say that the characters feel "real", but I'd definitely argue that they feel "right", which in some ways is more important. 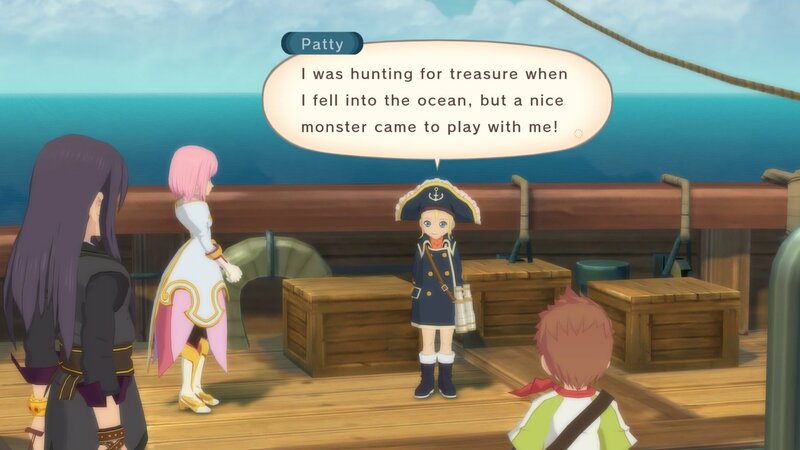 Even Patty, who might have been superfluous, gets time to shine and establish herself enough that it's hard to imagine people ten years ago thought the game was complete without her. Beyond the skits, other material helps flesh out character relationships, particularly the friendship between Rita and Estelle. Seeing those two spend time together also goes a long way towards affirming that Vesperia is - contrary to my wording from earlier in this review - not all about "Yuri and his buddies". I've lavished a bunch of praise on Tales of Vesperia's cast, but while it may lean into the best aspects of its parent franchise, it's not entirely the golden child of everyone's memories. Zippy as it is early on, the main story starts to drag its feet in the back half, displaying the kind of narrative flab that seems endemic to sprawling JRPGs. The combat doesn't quite rise beyond decent, either. A hybrid of combo-based fighting game and traditional JRPG-style command selection, the EFR-LMBS battle system turns out to be quite a bit simpler than its lengthy initialism suggests. It's simple enough that outside of the tough early hours, the biggest challenge in the main game is playing in such a way as to keep things interesting. Varying up combos and looking for a just-right string of Artes attacks, or combination of weapon-based perks is engaging enough, but I didn't feel pressured to really master the system. This led me to frequently use the convenient auto-battle option for most of the random encounters in-game. If the story and characters have aged gracefully, other troubles betray Vesperia's age. The control scheme fails to transcend awkwardness, and switching targets in combat proved a constant irritation for me, even after I'd gotten used to the proceedings. Though the art style and character designs (by legendary artist Kosuke Fujishima) hold up as well as anything, environments, in particular, are clearly rooted in a previous technological era. 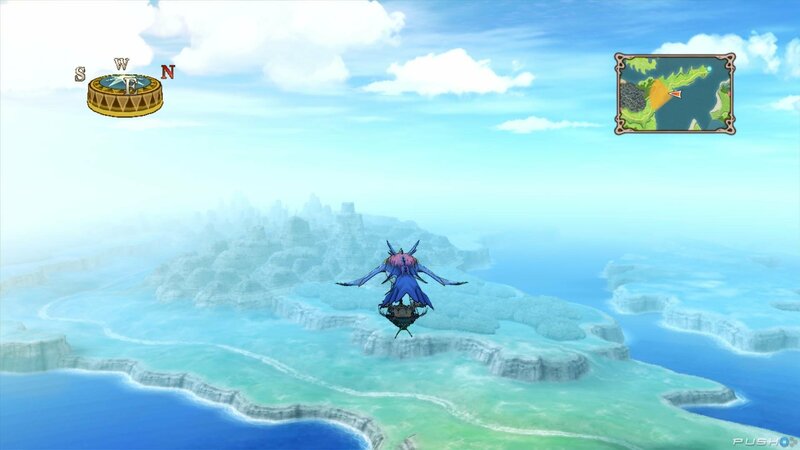 Further, the design of many of the game's side quests fails to engage the way the skits and main campaign do. Salting that small wound is the fact that some sidequests and the significant benefits they bring are easy to miss without consulting a guide (a step I recommend for the completionists in the crowd).